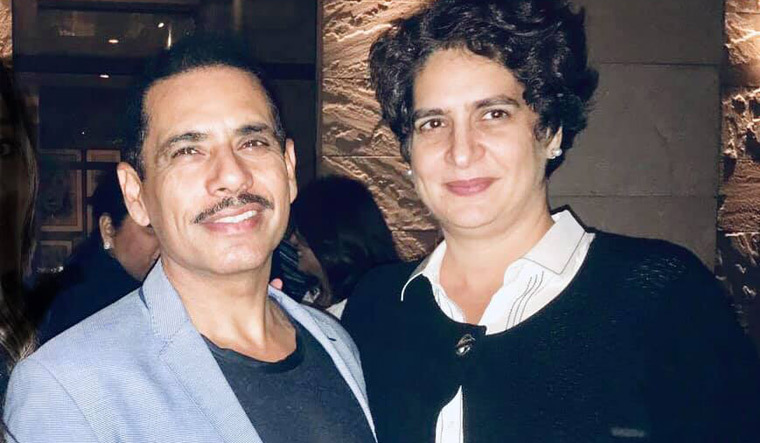 On a day when Priyanka Gandhi Vadra has made her official entry into politics with a mega roadshow in Uttar Pradesh, her husband Robert Vadra had an emotional appeal for all her well-wishers and critics: to keep her safe. In a rare show of affection, Vadra, in a Facebook post on Monday, also wished her all the best. "My Best wishes to you P, on your new journey of working in Uttar Pradesh and serving the people of India. You have been my best friend, a perfect wife and the best mother to our Children. There is a very Vindictive and vicious political atmosphere... But I know, it’s her duty to serve the people and Now we hand her to the people of India. Please keep her safe (sic)," he wrote. Her husband's land deal case is the only major threat that critics against the progress of Priyanka as a political leader. Vadra is under a probe by the Enforcement Directorate and was questioned for three consecutive days last week in connection with a probe into allegations of money laundering to purchase assets abroad. Vadra is also expected to make a fresh appearance before the ED on Tuesday in Jaipur in connection with a probe into an alleged land scam in the Rajasthan's border town of Bikaner. "He is my husband, he is my family... I support my family," she had said when asked whether she was sending a message by dropping off her husband. Priyanka is currently on a mega roadshow in UP capital of Lucknow. She was being accompanied by her brother and Congress president Rahul Gandhi and in-charge of western UP, Jyotiraditya Scindia.